A worm breeder, a woodsman, a seaweed maker or performative micro-naps… Welcome to Radical Relevances, the mighty strange conference, in Helsinki from April 25-27. I can’t say I have been to many conferences where one of the first speakers was a horse. Radical Relevances, organised at Aalto University in Helsinki by the artist and professor Pia Lindmann and others, asked: “How can we engage in new ways of thinking about and practicing in terms of human and nonhuman co-existence and flourishing in the midst of vast predictable and unpredictable planetary transformations.” A wide agenda, then, reflected by the varied methodologies employed by this conference, veering as it did from therapy session, political science seminar, non-human studies, shamanistic planetary healing ritual and radical anthroplogy meeting, as well as conventional academic papers ranging from mining in Greenland to being post-human. In the opening address, Pia Lindmann, who recently represented Finland in the São Paulo Biennale, talked about her work as a healer, working in the tradition of Finnish Kalelvala which imparts medicinal knowledge through an epic from the Middle Ages. Finnhorse Kristoffer, in the Laboratory of Presence, normally participating in equine events such as show jumping, dressage and mounted archery competitions, undertook a collaboration with artist Riika Latva-Somppi, in which he “contributes to the process by non-forced actions of his daily living allowing human observation and contact.” Conference delegates were allowed to stroke, scratch and whisper to him. As always non-human consent is a debatable issue here, but Latva-Somppi “has strived to open all her senses allowing the (art) process to happen in a shared state of being with the horse.” The horse seemed happy anyway. Radical Relevances was in a sense a celebration of emerging forms. 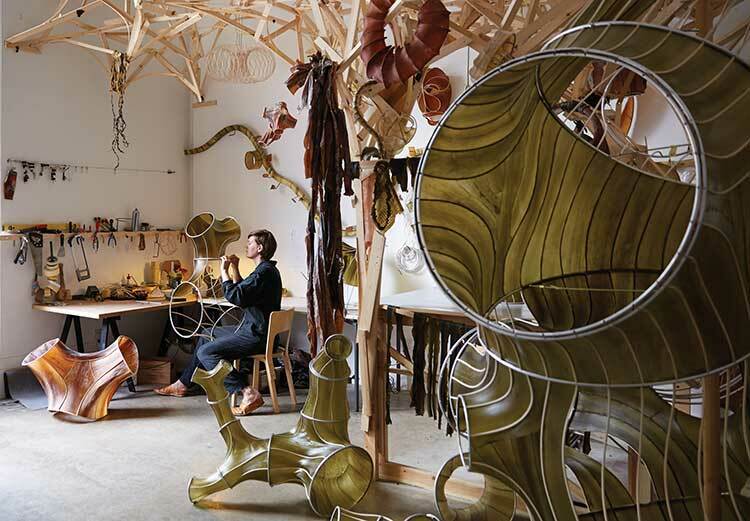 Maker Julia Lohmann used a six month residency at London’s Victoria and Albert Museum to create a Department of Seaweed, a “trans-disciplinary community of practice focussed on the sustainable development of seaweed as a resource for making” which uses the incredibly adaptable material of seaweed, which can grow up to 6 meters long and can be used for clothing, furniture, building—in fact everything including eating! She worked with makers, artists and anthropologists to create this semi-fictional department which also questions the nature of the museum institution. Petja Ivanova also creates living wearables with her “styroworms”, mealworms that live in and eat styrofoam. Of course we all know the ocean is now full of plastic. Ivanova takes another angle in describing the activities of the styroworm: “Styroworm’s work is to eat. Designed to burrow with eyes poorly developed and therefore guided by its gut, she digs and dives into the foodstuff polystyrene like an explorer and a miner at the same time, alienation from labour cannot be seen while munching, creating these underground levels of pathways, its home, home where the bug lays the eggs.” She wears a dress that is alive with these worms. Finland is in a sense the “Laboratory Nation” with many exemplary social innovations such as the universal basic income experiment which received a lot of publicity last week when it was announced that the trial would end at the end of this year, at the behest of the right-wing populist government. It had not failed—in fact many people felt it was not extensive enough. However experiment seems to be in the blood here. A unique facility has just opened here at Aalto University: Biofilia, the Base for Biological Arts, the only fully equipped biology lab in the world operated by an art school, located within an electrical engineering building, providing basic tools for molecular biology, microbiology and tissue culture for artists. 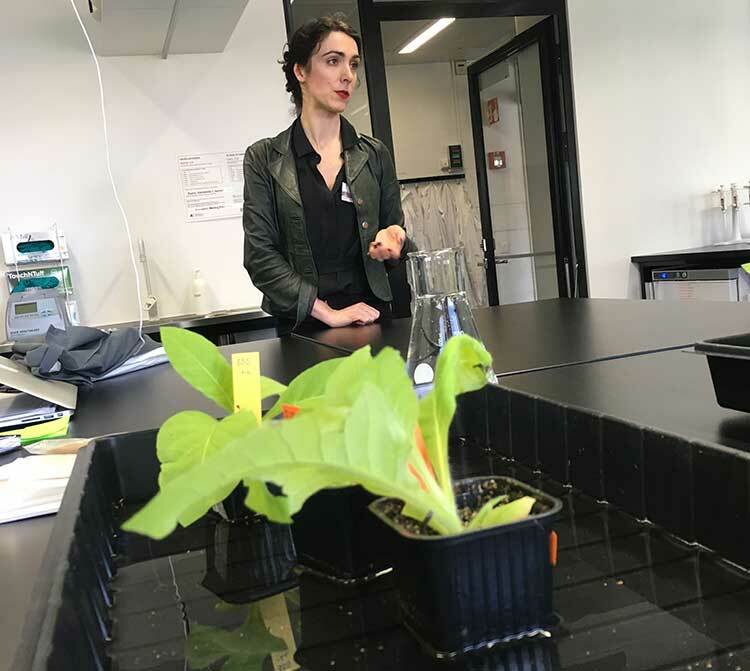 Unconnected to this initiative is the equally pioneering Bioart Society, headed up by Erich Berger—also at the conference. Their recent Ars Bioarctica residency in Lapland featured artist Elizabeth McTernan, who was interested in the methods used by by researchers who count lemmings jumping off a cliff—they really do, but not to the extent implied in the Hollywood movie The White Wilderness where apparently the producers pushed them off the cliff. McTernan created a Malevich-type square enclosure to mimic and critique the researchers counting methodologies. She used the term wild facts to discuss the “hallucination of objective representation—like our eyes tricking us when we try to see in the dark… the subjective act of counting—in all its inherent imperfection and error—forming the empirical basis for all so-called ‘objective’ knowledge and data collection.” This kind of critique is also pursued by the artist Bartaku who investigates the relation between light, plant, human/non-human body and electrical energy with a critical lab series featuring edible solar cells (Photoelectric Digestopians). He was part of a panel Frontiers In Retreat, which asks: “How can artists work within these remote locations and contribute to complex co-dependencies between human and other life forms?” chaired by artist/curator Taru Elfving. Surrounding all the talks were various participatory artworks. 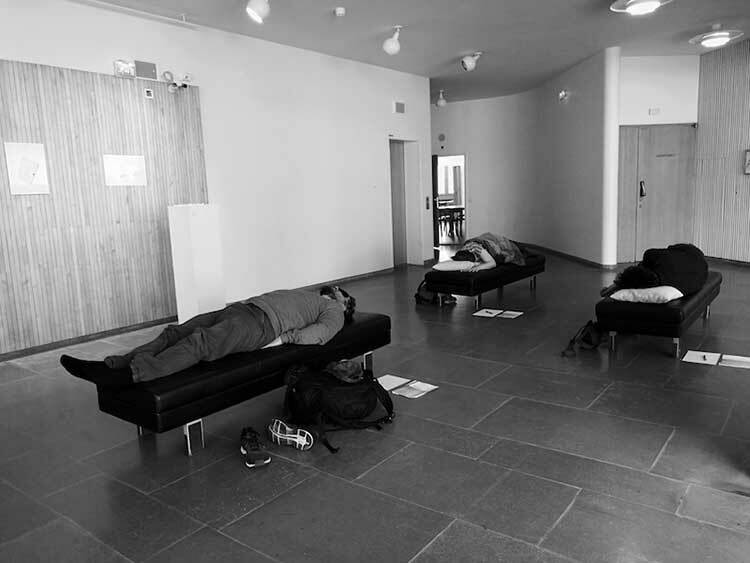 One of the most interesting of these was zNap – a Nap Happening by the sleep performer and visual artist Anne Glassner and the artist Bartaku where conference participants were provided couches to try ‘micro-naps’, ‘nano-naps’ and ‘lucid dreaming naps’. Much better than falling asleep during someone’s paper – unfortunately, despite the radical nature of the conference, there were still delegates who ‘read’ their papers mechanically – a practice which I feel should be banned at conferences, where we are creating climate change by flying to gatherings instead of reading the papers online or watching them on youtube. The conference ended with a total departure from the usual format, where the participants all were spontaeneously invited to sit on a carpet and consider the power of love to solve the world’s problems of war, destruction and post-anthropocene extinction. This was a brave and risky strategy by Lindmann and actually produced an oddly dynamic and conflict-ridden discussion, with angry outbursts rather like a group therapy session. It was followed by a participatory performance involving the entire conference with artist, performer and woodsman Duskin Drum. Not a normal conference, by any means.